Spectrophotometers have a long history in the scientific laboratory, primarily as devices for analyte quantification in solution. Myriad spectrophotometry applications use either the analyte’s inherent ability to absorb light or a reporter molecule, where its light absorption is directly proportional to the analyte concentration. Spectrophotometer evolution includes improved workflows and conservation of precious sample. An example of this is microvolume instrumentation for nucleic acid quantification, which uses a mere 1–2 µL of sample. As the measurement is non-destructive and a minimal amount is used, sample is conserved or even fully recovered. Conversely, most microvolume instruments are not useful for reporter molecule applications like colorimetric protein assays because reagent addition to quantify the analyte must be performed offline, and a small aliquot then used for analysis. This does not simply workflow or conserve sample, and the short pathlength defined by the detection volume requires that the analyte or reporter molecule have high absorptivity. In this article, we describe a flexible, evolved spectrophotometer system using an accessory to provide microvolume analysis of analyte with innate absorptivity, and also reporter molecule-based assays requiring sequential sample/reagent additions. We will provide examples of microvolume direct nucleic acid quantification and in situ microvolume protein quantification using the colorimetric agent bicinchoninic acid (BCA) and a cytotoxicity assay in a standard microplate using the colorimetric reagent MTT. The Epoch™ Multi-Volume Spectrophotometer System from BioTek Instruments was used for all absorbance measurements. The Take3™ plate accessory, which is included in the system, was used for all microvolume and 1 cm pathlength absorbance measurements. The Take3 plate has a standard SBS footprint and 16 microspots arranged as columns akin to those of a 96-well microplate. Samples of 2–5 µL may be pipetted into individual microspots, or a multichannel pipette may be used to load eight samples or blanks simultaneously, allowing both to be run at the same time. The Take3 plate can also accommodate two BioCells and one standard spectrophotometric cuvette. BioCell (also from BioTek) is a 1 cm pathlength vessel that requires less sample volume than a standard 3 mL cuvette. All 1 cm pathlength measurements were made with BioCell. Herring sperm DNA, BCA kit, bovine serum albumin, and all buffer salts were obtained from Sigma-Aldrich. The Vybrant® MTT Cell Proliferation Assay Kit was from Invitrogen, part of Life Technologies. Primary mesothelioma cells and thiostrepton were gifts from Professor Nick Heinz at University of Vermont. Standard, black polystyrene 96-well microplates used in the cytotoxicity assay were from Corning. Double-stranded DNA (dsDNA) standards were created by serial dilution of a concentrated herring sperm DNA stock in TE buffer (10 mm TRIS, 1 mm EDTA, pH=7.0). Take3 microvolume data was obtained with undiluted standard samples. BioCell data was acquired using either undiluted or, for higher concentration samples, a 20-fold dilution of standard in TE buffer. All sample measurements at 260 nm were background corrected using a TE buffer blank at 320 nm. All concentrations depicted are based on a 1 cm pathlength and 50 ng/µL OD. A method was developed to allow in situ analysis directly on the Take3 plate microspots. Briefly, the BCA assay was made by adding 2 µL protein standards and samples, followed by 2 µL BCA working reagent directly onto the microspots. Protein standards and samples in duplicate were added with a single channel pipette followed by addition of BCA working reagent using a multichannel pipette with mixing. Incubations were performed at room temperature for 25 minutes. Curve fits used quadratic functions as recommended by kit protocols. All BCA assay measurements were made at 562 nm and blank corrected. The blank was composed of a 1:1 volume ratio of BCA working reagent and de-ionized water. Primary human mesothelioma cells were seeded at 20,000 cells per well in 200 µL of DMEM/F12 media supplemented with 10% FBS, and were incubated overnight at 37°C in a humidified 5% CO2 environment. The cells were then treated with thiostrepton, a polypeptide antibiotic, at concentrations ranging from 20–0.0195 µM with eight replicates per concentration and incubated for an additional 24 hours. MTT reagent was then added, and absorbance was read at 570 nm. All absorbance measurements were blank corrected where the blank consisted of media and MTT reagent. 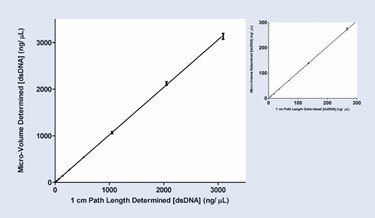 Figure 1 demonstrates the linearity of a dsDNA calibration curve. Abscissa data is reflective of measurements made with 1 cm pathlength; these measurements are considered actual dsDNA concentrations. Ordinate data reflects microvolume analysis obtained with the Take3 plate accessory using 2 µL sample volumes. Insert is an exploded view of the low dsDNA concentration calibration curve. Excellent linearity is available over three orders of concentration magnitude. This dynamic range covers the expected concentrations of isolated dsDNA from genomic DNA isolation kits (20–200 ng/µL) and plasmid DNA isolation kits (500–2,000 ng/µL). The linear regression slope of 1.000 ±0.0038 to a 95% confidence limit can also be used as a measure of microvolume quantification accuracy relative to 1 cm pathlength measurements. We have devised a method for the addition of 2 µL protein standards or unknown protein samples, followed by 2 µL BCA working reagent directly to the microspots of the Take3 plate accessory. Sixteen microspots on the plate allow for a six-point calibration curve in duplicate and four microspots for unknown samples. 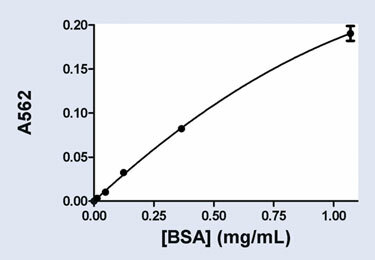 Figure 2 depicts a BSA standard calibration curve of 0.01–1.0 mg/mL, which was used to quantify two BSA samples of known concentration: 0.037 mg/mL and 0.34 mg/mL. In situ microvolume analysis produced accuracies of 0.99% and 1.5%, attesting to the high accuracy provided by running samples and standards on the same microplate. The Epoch Spectrophotometer system can also be used for standard microplate colorimetric assays. 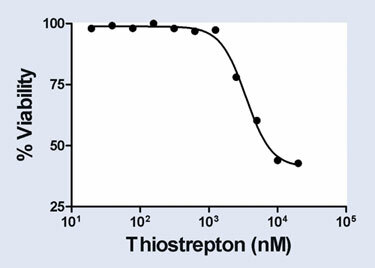 An example is provided here for the quantification of thiostrepton’s cytotoxic effects using an MTT assay. Figure 3 demonstrates the viability of mesothelioma cells seeded in a 96-well plate to 20,000 cells/well with increasing thiostrepton dose. As expected, thiostrepton demonstrates cytotoxic effects on the cells with an EC50 of 3.5 µM, consistent with previously published work. The Epoch Spectrophotometer System is flexible for microvolume, cuvette, and microplate-based determinations. Accuracy in direct DNA quantification is comparable to 1 cm pathlength cuvette-based measurements with improved ease of use and sample conservation. The microplate accessory can also be used with reporter molecule-based assays such as BCA in microvolume format. This maintains a simple workflow and conserves sample. Six-point calibration curves can be conducted in duplicate with four microspots available for unknown quantification. Measuring both standards and samples on the plate yields accuracies <2% different from 1 cm pathlength measurements. Finally, the spectrophotometer system can be used in myriad microplate-based colorimetric assays, including cytometric experiments using MTT. Peter Banks, Ph.D. (BanksP@biotek.com), is scientific director, and Peter Brescia is applications scientist at BioTek Instruments.